“We were frank with [Manziel] on Friday,” Haslam said. “That’s the expectation, you’re the backup quarterback. This is a hard-working, blue-collar town, this isn’t Hollywood. We want you to come in and go to work.” Whether Haslam was referring to Draft Day the Kevin Costner film that depicts the Cleveland Browns in a fictional NFL Draft or hometown quarterback Brian Hoyer, the Cleveland-born starter who lead the perennially awful Browns to a positively startling 4-2 record last season, or a third, unknown Hollywood-Cleveland parallel is not yet clear. Manziel, who was one of the most-talked about college players during his tenure at Texas A&M as much for his headline-ready antics off the field as his exciting and occasionally reckless playing style, has already snagged one first: Since being drafted, he’s had the best-selling jersey in the league. His new teammates are well aware of the spotlight that Johnny Football brings wherever he wanders, but like their owner, denied that Manziel would overshadow the rest of the team. Manziel was selected 22nd overall in the first round of the draft. The Browns start their training camp on July 25. 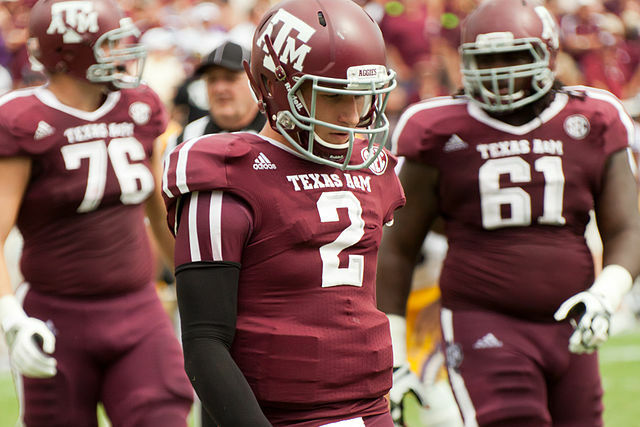 Manziel’s fantastic performance against Alabama is below, and it’s well worth a second viewing.